Frei Betto: "We must stop pessimism for better days"
"We must leave pessimism for better days" is the slogan of Brazilian sociologist, theologian and writer Frei Betto for the days in which we live. The above transcended in his intervention in the panel 60 years of his triumph: Historical significance of the Cuban Revolution and legacy of Martí and Fidel, made today as part of the program of the IV International Conference for the Balance of the World that takes place until this Thursday in the Convention Center of Havana. With a rhetorical question the theologian began his dissertation. What explains that Cuba is the only socialist country in the West that survives the fall of the Berlin Wall? And he pointed out: "It is very easy to defeat a government but you can not overthrow a people; and that imperialism knows from the experience of Vietnam". There are several factors and listed among them the role of popular organizations to create a culture of human subjectivity and make Cubans feel proud of their identity. Another aspect is that the historical figures are not of museums, history is kept alive and that from a strategic project of construction of political consciousness. He also referred to the deeply internationalist culture that characterizes the Cuban Revolution since its inception, as well as the work of institutions such as Casa de las Américas throughout the world, creating a strong feeling of solidarity with the revolution. Another decisive aspect to keep this nation on its feet is, according to the Dominican friar, the ability to make self-criticism at various times during these 60 years and the constitutional reviews are an example of this. 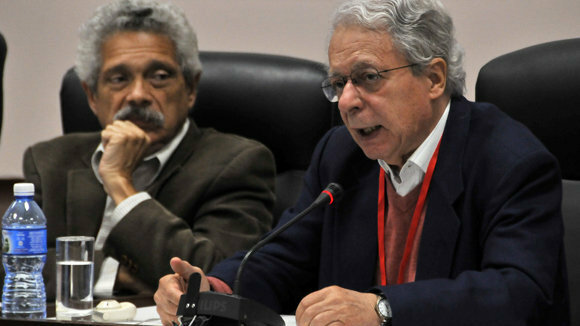 And finally Feri Betto referred to the capacity of Cubans for humor, in the deepest sense of the word. "It's a capacity that they should exploit better. There are many countries extremely bored, arrogant, with low self-esteem, and here not; People are always making jokes, even in times of difficulty, even in the special period. I think they should deepen the humor in Cuban culture",he said.